State Department exhibition features work of student photographers, videographers and designers. Wesley Mathews' portrait in "Faces of Diplomacy," an exhibition created by Corcoran students. Photo courtesy of U.S. Diplomacy Center. It was up to Corcoran alumnus Pratik Shah, B.F.A. ’14, to tell the story of an American diplomat named Wesley Mathews. Like a lot of the general public, Mr. Shah couldn’t quite picture the day-to-day of Foreign Service officers, who seemed to work quietly behind the scenes, often in remote overseas locations. The profession seemed shrouded in anonymity, the details hazy. But that description hardly applied to Mr. Mathews, a charismatic Texan who’d dreamed of a career in diplomacy since he was in high school. His resume is studded with appointments to Lagos, Berlin and New Delhi. On the surface, the two have little in common. But as Mr. Shah dove into the project, he connected with Mr. Mathews. There were trivial ties, like the fact that Mr. Shah’s sister went to Mr. Mathews’ alma mater, the University of Texas at Austin. Then there were more intimate links, including how they both grew up in the same town outside of Dallas in families that had emigrated from India. 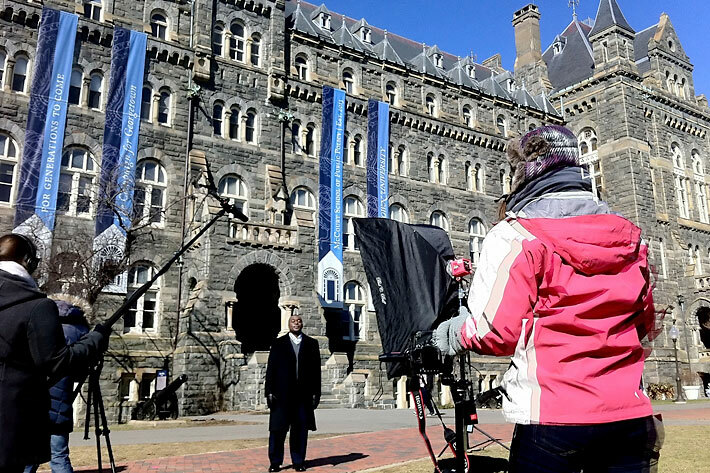 Mr. Shah tapped into that sense of familiarity and kinship to share Mr. Mathews’ story in “Faces of Diplomacy,” a collaboration between the Department of State and the George Washington University’s Corcoran School of the Arts and Design. The exhibition was funded as part of a grant from the Annenberg Foundation to the Diplomacy Center Foundation (DCF). “Faces of Diplomacy,” which coincides with Fotoweek D.C., is part of the groundbreaking celebrations for the U.S. Diplomacy Center (USDC), a museum and educational center currently under construction at the Department of State’s headquarters. Corcoran students were in charge of making videos of the subjects included in "Faces of Diplomacy." Photo courtesy of U.S. Diplomacy Center. Using videos and large-scale portraits of Mr. Mathews and nine other diplomats, the exhibition epitomizes USDC’s goal of taking audiences behind the curtain of American foreign affairs and showcasing those who work in diplomatic service. “Faces of Diplomacy” will move to the completed Diplomacy Center once construction wraps up in 2016. “This exhibition shows that diplomats and people who work in diplomacy come from big towns, from small towns and from all walks of life. They bring rich experiences to diplomacy, accomplishing amazing things on behalf of the American public,” said USDC Director Kathy Johnson. Olive Sampson, a senior advisor at the USDC, first reached out to Muriel Hasbun, a professor and program head of photography at the Corcoran School of the Arts and Design, to find faculty experts who could create the exhibition. Ms. Hasbun has led several educational collaborative projects in past classes and suggested that perhaps students at the Corcoran could put “Faces of Diplomacy” together. It would give them a chance to learn about the technical aspects of producing portraits and videos while also working for a professional client. Ms. Sampson was immediately enthusiastic. Ms. Hasbun took the idea to Benjamin Tankersley and Michael Kleinfeld, a pair of professors with the exact skillset needed for the project. Mr. Tankersley is a freelance editorial photographer who’s done work for publications throughout D.C. Mr. Kleinfeld is a multimedia journalist who knows the ins-and-outs of video and audio production. “It sounded ambitious, and I liked the idea of teaching students how a real-life commission works,” Mr. Tankersley said. Both professors were collaborative in their approach and engaged students from the beginning. They had an early brainstorming session, where they encouraged everyone in the class to propose what the exhibition should look like. Several ideas floated around: Maybe conceptual images on a stark-white background? Or day-in-the-life-style videos? “Just like in the real world, they had to think about what their client wanted and what they could realistically produce in 15 weeks,” Mr. Tankersley explained. The students decided to shoot portraits of their subjects in natural environments that spoke to their experiences. 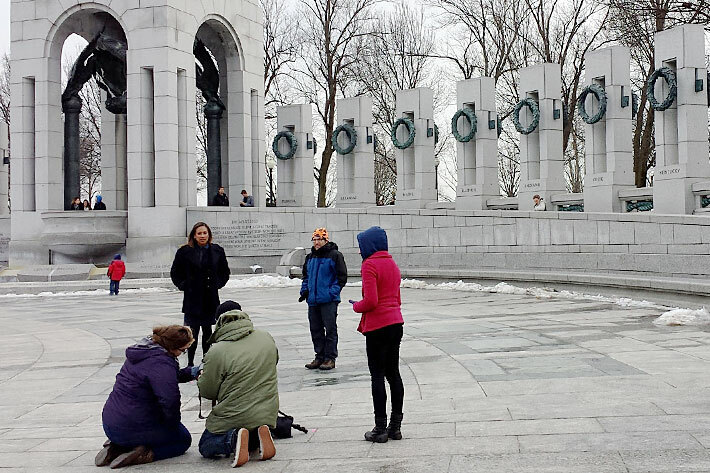 When junior Samantha LaRoche photographed Esperanza Tilghman, she picked the World War II memorial as her backdrop to honor the diplomat’s veteran father. The class set up video interviews at the State Department and shot b-roll footage at nearby locations. Mr. Shah’s video includes playful takes of Mr. Mathews hanging out at D.C.’s Texas-inspired barbecue joint, Hill Country. Corcoran students set up portrait shoots for diplomats featured in the exhibition. Photo courtesy of U.S. Diplomacy Center. Ms. Hasbun took the collaboration a step further and suggested that Design Corps, a group of graduate students led by Corcoran Assistant Professor and Program Head of exhibition design Clare Brown, handle the exhibition installation. Corcoran graduate students worked on the graphic elements and technical aspects of the show, figuring out how the videos would be displayed alongside the massive photos. Second-year graduate student Emily Clark tackled the intricacies of the technology, deciding to use iPads to showcase multimedia elements. “The photographs were so striking and visually compelling that the design fell into place,” she said. Already, the final product has created a stir at USDC. Last week, Ms. Johnson toured the halls of the fully installed exhibition, admiring the portraits and videos. As she made her way through the exhibition, Secretary of State John Kerry’s photographer joined her to preview the work of students. 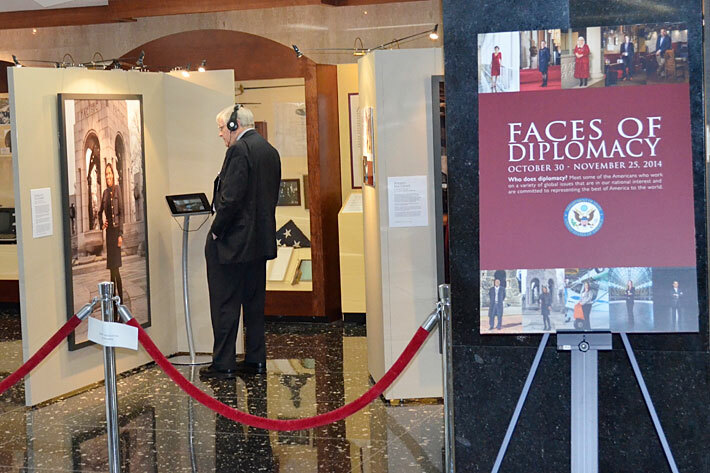 “Faces of Diplomacy” will be displayed in the State Department’s Exhibit Hall and will be open to registered guests from Nov.10-14 at 2:30 p.m. via a daily guided tour. On Nov.10, the tour will also include a special presentation on the making of the exhibit. Anyone interested in registering should e-mail [email protected]. The exhibit will be closed for Veterans Day on Tuesday, Nov. 11. To learn more about educational opportunities and programs with USDC, visit http://diplomacy.state.gov/.